Experimental specimens spotted on the loose in the vicinity of Headup Headquarters! ATTENTION: Headup does not take responsibility for any injuries sustained while attempting to pacify the escaped specimens / employees. Furthermore, Headup confidently objects any claims or statements made by the escaped specimens / employees concerning inhumane or oppressing working conditions at Headup HQ - all employees took part in the project of their own free will and in contrast to any potential depictions made by the employees, were not at any point in time threatened, coerced, drugged or physically / mentally / emotionally manipulated into agreement. Tied Together will come to Nintendo Switch™ on October 19. This evil you cannot fight - run for your life and find a place to hide. 17 September 2018 Developer studio Cracked Heads Games will release their debut title Silver Chains in collaboration with Headup in Spring 2019 for PC, PlayStation®4, Nintendo Switch™ and Xbox One. Using Unreal Engine 4, Silver Chains' graphics bring to life the hauntingly beautiful interiors of an early 20th century English manor. The Victorian architecture plays its part in creating an eerie atmosphere which will keep you on the edge of your seat as you unravel the mysteries of this place. 07 September 2018 Dead Age, the tactical zombie horror RPG from Headup and Silent Dreams, is available now on Xbox One. You'll get the game now for $11,99 / €11.99 / £9.59 (20% off) for the first days, afterwards it will be at 14.99 / £11.99 again. The game drops players right into the middle of a fierce zombie apocalypse, challenging them to rebuild society and make tough decisions while fending off hordes of undead in tactical turn-based battles. This combination and its unique atmosphere brought Dead Age great success on Steam and a "Very Positive" overall rating with over 2500 reviews in total. Thanks to the fantastic community support, Xbox One players are lucky to receive the best version possible, improved hand in hand with the players. Slime-san Level Editor - Create your own slimey levels for the world to tackle! 28 August 2018 Still hungry for more slimy goodness? The next free Slime-san patch will be the ultimate solution to that. Yes, it's really happening: We're excited to announce the Slime-san Level Editor enabling you to create and share your own levels with your friends and the world! Browse and rate levels online or share them directly via ID code. And yes, the editor will feature full & friendly gamepad compatibility. Slime-san's developers Fabraz teamed up with David Laskey, from TumbleSeed fame, to make this the best experience you could imagine. To top it all off Meganeko will be creating a new track while Del will delight us with another beautiful piece of artwork! With this feature-filled level editor you'll truly be able to create and share your own unique levels and is estimated to release this Fall! The best part? We'll be releasing it as a standalone game as well on Steam! Speaking of platforms, we're planning to add the level editor for Nintendo Switch™ as a free update, too! We will keep you updated. 17 August 2018 The past few weeks a lot has happened in our little Trüberbrook: Most of the villagers have been given their voices, all the houses, squares and secret science labs have been built and the team is about to go on a great journey... To give you an impression what the game looks and feels like, we have assembled our new "Interrogation Trailer". For this, we have only used hand-picked and unaltered ingame material. Have fun watching! We hope you like it! Stop Lord Necrosis and his masses of enemies in this unique mashup of RTS, tower-defense and RPG! Headup and Happy Tuesday unleash the undead onto Xbox One, PC and PlayStation@4 today. 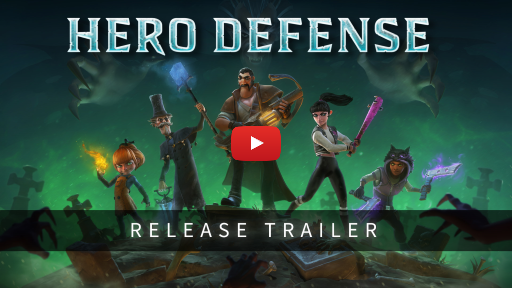 Hero Defense lets you create your own strategies to fight off vampires, skeletons, angry witches and many more gruesome creatures - with style! It innovatively mixes together RTS and tower-defense game elements. In particular, RPG elements add enormous depth by providing players with a large variety of ways to improve the heroes' many abilities. Prove your tactical prowess by utilising the most effective combinations and create your own unique playstyle. Help vampire hunter Jack Sanders and his tough group put an end to the undead scourge once and for all. Jack comes from an old noble family of vampire hunters who have fought the darkness for generations. But this quest is more than just business to Jack - this time it's personal! Count Necrosis is none other than Jack's own father, who betrayed everything his family stood for by embracing the very darkness which claimed so many of the family's lives. In response, Jack swore to hunt down and kill Count Necrosis in order to redeem the family name. But when the time comes, will Jack be able to plunge a stake into his father's heart? You will rebuild an entire town to get access to even more upgrades, advancements, skill trees, runes, magic spells and a whole arsenal of modifiable weapons. Figure out which combos work best for you, in Hero Defense the possibilities are limitless! Due to its dark fantasy setting - including vampires, werewolves and Igors (assembled with love!) – Hero Defense will appeal to a wide spectrum of players as well as providing them with novel challenges. In addition, you will encounter bosses, such as Bones O'Malley and Doctor Amalgam, the Igors' creator. All five heroes' abilities are tailored around their rich backstory, reflecting their individual personalities. Improve them in multiple ways to match your gameplay style. In the end, though your strategy skills will determine whether you succeed or fail: combine your heroes' strengths and coordinate their movements efficiently. Shrines and strong auras will serve as natural ideal spots whose usage will be inevitable to defeat the hordes of sinister enemies. 10 August 2018 After Runbow's recent digital release on the Nintendo eShop and on the PlayStation®Store, 13AM, Headup and Merge Games are excited to announce that the physical Deluxe Edition - including all DLCs - as well as two colorful sticker sets (for the EU version), are available from today onwards! The DLCs included are Satura's Space Adventure as well as all 4 costumes and music packs. The pricing of the Deluxe Edition will be €29.99 / £24.99 / $29.99 for both platforms, PlayStation®4 and Nintendo Switch™ - and it contains so much fun for the whole family! You'll also get it on Game Fairy including the soundtrack on CD as digi-pack. This game will strengthen yours and your friends' ties! 07 August 2018 Following the recent launch of Runbow, Headup Games tied themselves together with Napalmtree and announce the next crazy party game for Nintendo Switch™: Tied Together! Played cooperatively with up to four players, the game brings hours of screaming and yelling! Single players don’t even stand a chance to handle the monsters' challenges. Also, it's a lot more fun to play with friends instead of playing alone, right? As a team you have to coordinate your movements, jumps and cling to the ground and walls in order to complete the levels and stay alive. It's not as easy as it sounds, but all the funnier! Every time your monstrous cooperative skills are not enough it will end in great chaos – and great laughter.